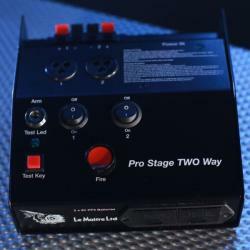 The Prostage 2-Way Controller is a battery operated cap discharge controller suitable for use with both Pyroflash and Prostage II effects. Each of the 2 channels can be fired individually and up to 8 effects wired in series (16 effects). Or up to 16 effects if only one channel is to be used. Cable lengths of up to 150 feet per channel are supported, or any combination of lengths up to this limit.